he New York Red Bulls selected midfielder Jared Stroud and forward Jose Aguinaga in the fourth round of the 2018 MLS SuperDaft, presented by adidas, on Sunday afternoon. Stroud, the 83rd overall pick, and Aguinaga, 85th overall, both played for the New York Red Bulls Under-23 team in the Premier Development League last Summer. "This is an exciting day for both Jared and Jose, and we are pleased to welcome them to the club," said Sporting Director Denis Hamlett. "Giving young players opportunities is a key part of our philosophy. We are familiar with both of these players from our Under-23 team, and we look forward to getting them into our professional environment so they can continue to develop their game and take the first steps in their careers." Stroud, out of Colgate University, is a native of Chester, N.J. Stroud was named to the first team All-Northeast region in 2017, leading the Raiders to their first appearance in the NCAA Tournament Sweet 16. As a senior, Stroud was named the Patriot League Tournament MVP, and was named to the All-Patriot League First Team as he set a new program single-season assist record (13) and also added four goals. He finished his career with 10 goals and a school-record 30 assists. He also earned Academic All-League Honors as a junior and senior. 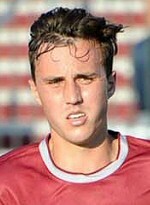 Jared is the older brother of Red Bulls Academy's Peter Stroud, currently a member of the U-15 team. Aguinaga, a native of Madrid, Spain, finished his collegiate career with 18 goals and a school-record 32 assists in 76 appearances for the Rider University Broncs. He led the team with nine assists in each of the last three seasons. He is a three-time All-MAAC selection and was also named to the MAAC All-Academic team in each of the last three years. He recorded three goals and nine assists as a senior and was named to the United Soccer Coaches Second Team All-America as the Broncs made the MAAC finals for the third-straight year.